chest behind held a complete V-rank Mounted Cornet. Every pipe was from scrap, but it sounded good! I think every organist dreams of having their own instrument at home. From the age of twelve, I used to hang around at R.H.Walkers (Organ Builders) in Chesham, Bucks working in my school holidays as sweeper-up, tea-maker, key-holder and dogsbody. At lunchtime we used to sit around discussing the organs. Despite the fact that our work during the week mostly dealt with new (small) tracker organs, each and every member of that firm had a project on the go at home and quite often they were larger than the ones we built during the day. 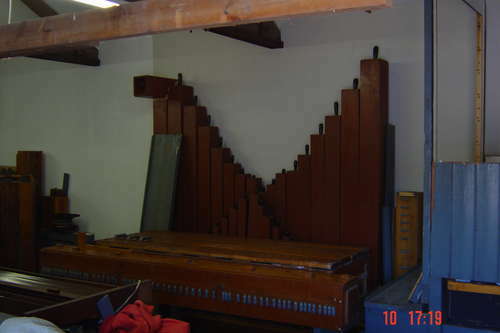 My foreman (George Turner) was building a three-manual tubular-pneumatic organ in his cellar with swell-shutters in the floor of his (tiny) sitting room. His argument for using tubular-pneumatic action was that he could make every part for himself. He was a splendid craftsman, it was a joy to see how beautifully everything had been made and I visited quite often. He kept saying 'of course, it'll never play' and rather sadly, he was right. My first attempt never played. I took a tiny pneumatic touchbox to be the soundboard for the trebles of my organ, and made a new soundboard to take the basses. 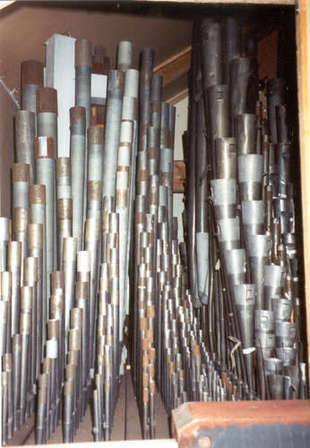 This had a complicated action which involved parallel pallets for each of the three divisions so that bulky bass pipes could be shared via a fly-pallet system. I made the reservoir myself and even a marine-plywood fan because I had been told how expensive blowers were. When I think that just recently I left some blowers for the scrap man because I had no use for them and nobody seemed to want them, it fills me with horror to think how hard (and unnecessarily) I worked. 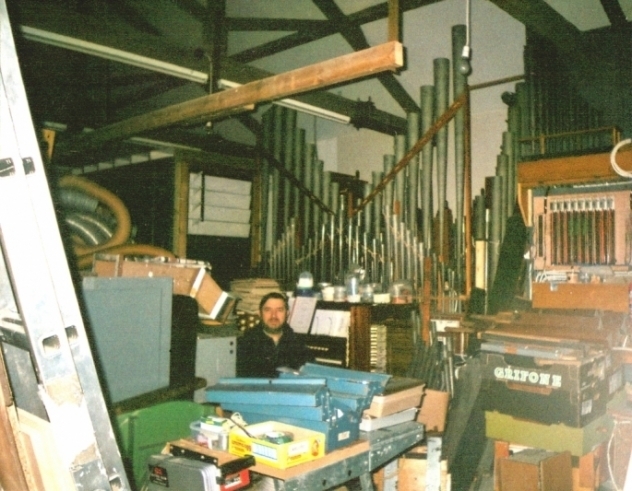 The first house organ of mine that actually worked used salvaged parts and pipes from a condemned church building in the Stoke-on-Trent area. It was a three manual and pedal of roughly 20 stops, but the middle manual had no pipes, it permanently coupled the other two. I had a lot of fun playing this as it stood in the garage of our second house in Shrewsbury. Sadly, the roof was not good and after a year or two there was so much water damage that when the time came to move, I scrapped the chests and kept the pipes. In our third Shrewsbury house there was a dry cellar. I got so far as to drag a soundboard and a large blower down there, but got nothing playing - too busy at school and at Shrewsbury Abbey where I had recently been appointed Organist and Choirmaster. When the time came to sell the house, the prospect of dragging that blower back out of the cellar was too much like hard work. I wonder what the new owners made of it... probably not a house organ at any rate! All this time I had been carrying out organ-building projects for/with others. 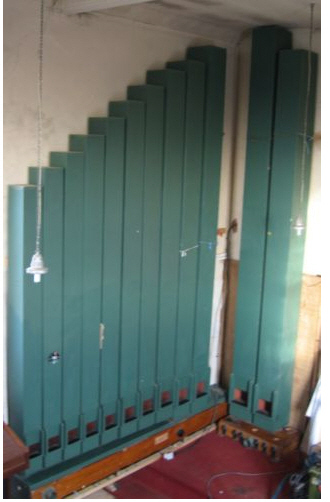 I had put a seven rank extension organ in a Cheshire farmhouse and a small two-manual tracker organ with a classical-style specification into a bungalow in Shropshire. I had made friends with a retired road engineer and ex-bomber pilot by the name of Peter Ward who owned a small-holding and pony stud near Ellesmere. He was a great man, a fair player, but especially a keen DIY organ enthusiast. 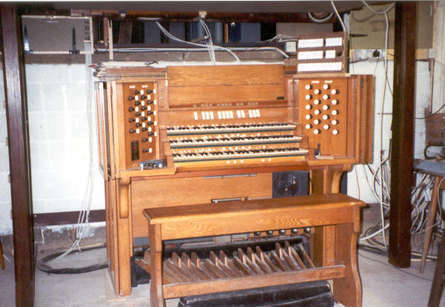 His house organ (when we met) was a large two-manual played from a smart three-manual drawstop console. It's a small world: I discovered later that this console had been made by B.C.Shepherd and his son John for Emmanuel Church, Norwood. I first met John and Eric Shepherd in the 1970s and they are still friends of mine; they possess some of the best ears in the business and I have regularly recommended them to churches with organ problems and never been disappointed with the results. It was not perfect, but it was a lot of fun. We had a few private concerts on it and I practised on that organ for months before I made my first two recordings for the BBC. When Peter Ward sadly died, he left me the organ in his will - also a year's grace for it to be removed. In the event, it took eighteen months of solid searching before my wife and I found a house with sufficient space. We had been living in a four-bedroom semi-detached house on a 1980's Cheltenham estate; when we eventually found The Old George, Dymock it was like love at first sight. The house was big (a former pub and butcher's shop) and extended to five bedrooms, but beyond the house and up the yard was a range of outbuildings running virtually as far as the eye could see. 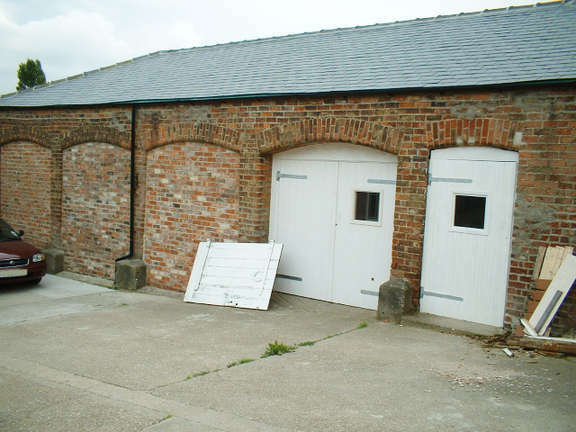 Since it was listed, I had to negotiate with local authority planners, I wanted to take down a small partition between two rooms of what amounted to an old stable block for the organ and of course they got involved. They also insisted that I line the building with 4" thick mineral wool to deaden the sound. 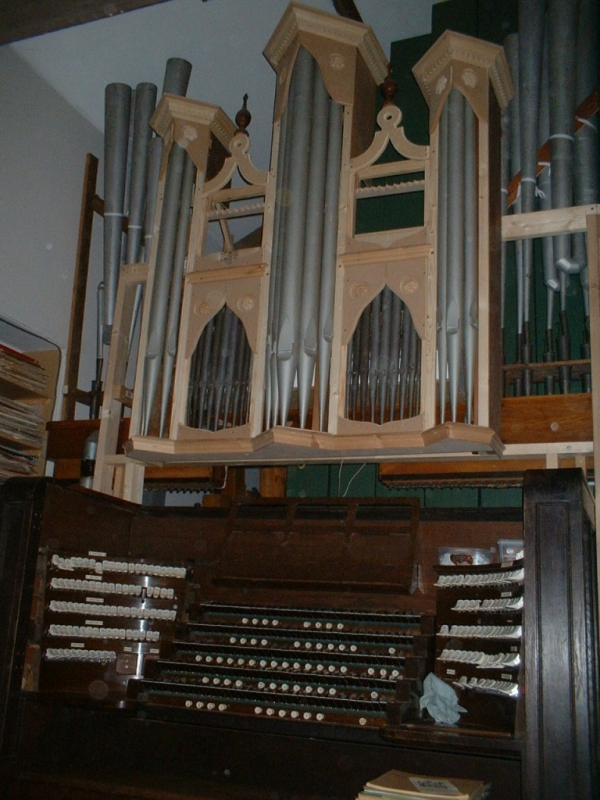 This was an effort and an expense, but at last I got somewhere fit for Peter Ward's organ. In the meantime two major bits of luck: I heard that the redundant organ from St Paul's Walsall was just waiting to be taken away from Shifnal Parish Church. 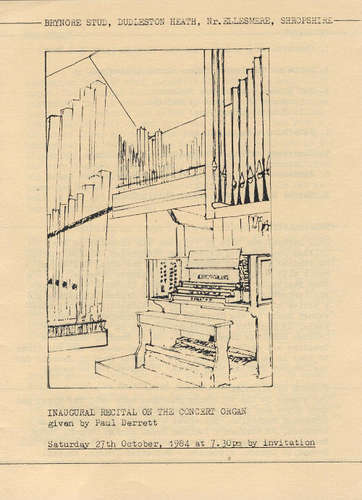 St Paul's building is now mostly a shopping centre, and Hugh Smith the organist and choirmaster at Shifnal (who runs an excellent choir) had lusted after this big romantic instrument. Having taken it down with volunteer help, he expected that he would be given permission and funds to install it. No chance - the diocesan officials wouldn't go for it! Shortly afterwards he moved to direct the music at St John's Church, Wolverhampton. 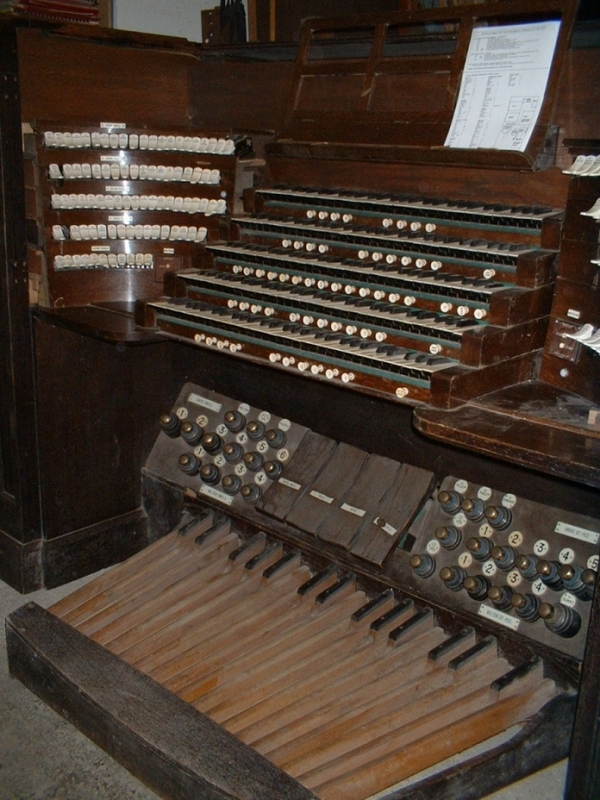 The organ at St Paul's Walsall had been the show job of the Victorian firm Nicholson and Lord. Coincidentally, it had been rebuilt in 1956 by none other than my old firm, R.H.Walker. It was the largest job that ever went through our works and one that George Turner had often referred to. He would have been heartbroken to learn of its fate, even if it did come back to a part-time member of the firm. I bought it in its dismantled and unplayable state for £600! The specification was complete in virtually every respect and ran up to Tubas at 16 and 8' on Choir and Great. I added all this new material to my pile. Some of the pipework had been damaged by being moved carelessly, but the good stuff was really splendid. Wanting to be able to change my pistons from time to time, I thought of the redundant material at Tewkesbury Abbey. A major rebuild was being carried out by Kenneth Jones of Bray, Ireland and I knew that neither the piston cupboard nor the five-manual console would be needed again. Why not write and offer them money for these? To my surprise the Abbey authorities accepted my pretty modest offer. Kenneth Jones said that for a sum (several hundred pounds) he and his men could erect scaffolding and move the console out of its small gallery for me. I couldn't accept this kind offer - I had no money! Instead a team of three of us, [Father Charles Watson (the organ-building monk of Prinknash) a sixth-former (James Fry, who later became my sound engineer for the first Benchmarks CDs) and I] cut the cables, took it apart and took all the bits back home in a single afternoon. So, I had a three manual DIY project... masses of good material ex. Walsall and a five manual console. What would you do? Silly question! I made a vast great organ of the lot, using up all the space I had, with a long-term plan that someone would make me solid-state switching so that I could play it all from the five-manual console. N.B. There was no manual extension, and all the stops listed here actually played... several more were waiting to be connected when the call came for us to move house to take up a new post in Hull. Everything in Dymock had to be crammed in because of a relatively low roof. 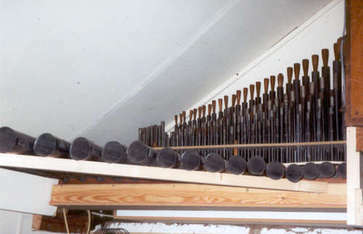 Fluework starts left, through strings and upperwork to reeds to the Right. 2. once you tune a pipe with one of these it stays in tune, unlike pipes blessed with shiny tuning slides which can have considerably less grip. When we moved to Yorkshire everything worth keeping had to come with us. This took an extremely arduous two months of 400-mile round trips involving the considerable and most generous help of friends at both ends of the journey. As I write, some of it is still in store (ten years later) waiting to be added to my house organ over the years to come. From time to time I intend to update this page of my website and put up photographs of the progress of this project. Man gotta have a hobby! Remember this site, and please feel welcome to use it in order to point out to your nearest and dearest that your obsession is not as bad as mine! 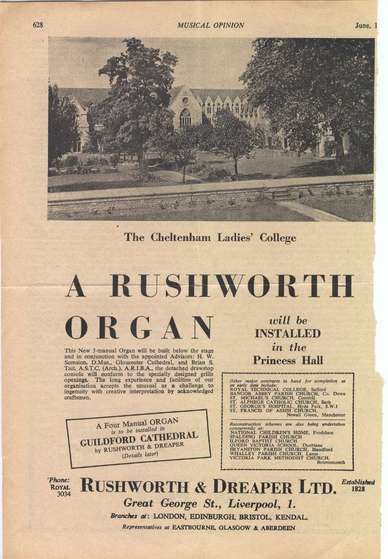 In late December 2006 I and a party of hard-working friends removed the three-manual Rushworth & Dreaper organ from the Princess Hall of Cheltenham Ladies' College. This was built in 1960 to the design of Herbert Sumsion and modified in 1990 by Walkers to a scheme drawn up by John Sanders. Those who know of John Sanders' organ at Gloucester Cathedral (which bristles with neo-classical upperwork) will be surprised to learn that his 34-stop scheme included neither a mixture on the Great, nor a Tierce anywhere! Rather oddly, this organ had been installed in a pit below the school stage; not surprisingly it did not sound particularly well in the hall. Some of the pipework is excellent (quite a bit of it is actually older than the Rushworth & Dreaper rebuild) and two of the three manuals have been left more-or-less unchanged in my grand scheme. 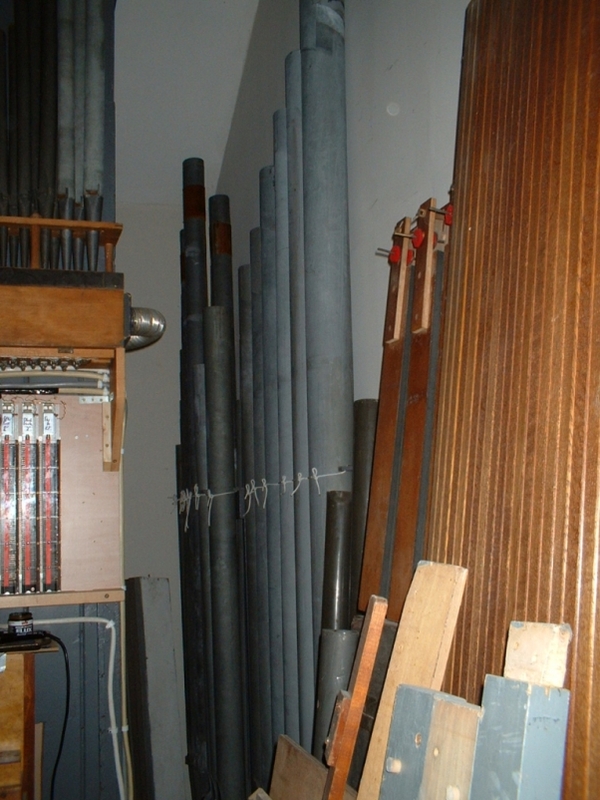 I have kept the Cheltenham organ virtually as it was for use as a rehearsal instrument, while making provision so that these three manual divisions will be available on the five manual console. The main change has been the radical replacement of the Great pipework, all of which was much too loudly voiced for comfortable listening in my barn. For instance, the R & D Great Tromba became my [huge] Tuba. I have also used wasted space in the Choir box to add three additional stops. The Swell has been augmented with straight reeds 16.8.8.4, a Nazard and a 4' Flute. A Vox Humana, a Piccolo and another rank of upperwork await connection to the large console before they can be played, I do not want to spoil the Cheltenham console by adding extra drawstops to it. This is was the first rank to be fitted up in my barn - the Cheltenham Bourdon - it sounds like an Open Wood in here! In front of that is the soundboard for the small Great and to the right you can see the Choir box being erected. on the Small Great. I love the effect - a soft open 16' added below a chorus gives a real richness and completeness to the sound. A few years ago, I spotted a 32' Bourdon for sale on e-bay. It was a huge effort getting it back here, and just as much effort getting it in - there is a gap of only 4" between the longest pipe and the roof of my barn, it took three good men to lift it in. I wired it in, replacing a quinted bottom octave. In theory, it ought not to work in a room of this size, a question of standing waves etc. - but in practice it's just wonderful! The 32' Bourdon as it looked set up in a former chapel out in the wilds a few miles north of Birmingham, photo taken when we went to collect it. To appreciate its true size, compare the pipe tops to where the (standard height) lightbulb hangs. There are no stoppers, each pipe is literally closed with a felted board screwed onto the top. It's always like this - no room to move! 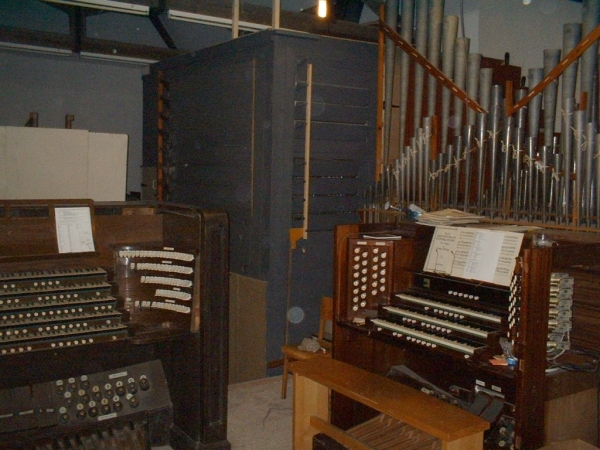 This is a photo taken about four years ago showing me, my tools and the basic layout of the three-manual: The Swell box can be seen on the left (with a small set of shutters facing the three-manual console and a large set facing the other), the Small Great lies in the middle behind the console, the Choir box is partly visible on the right with recycled ladder-switching and some pedal Salicionals fixed to the side panel. N.B. The Choir shutters (not visible here) face the consoles. All guts have since been panelled in. The large reed just behind the console is the former Cheltenham Tromba, it's my Tuba and it's inordinately loud on only 7" wind.. The most recent improvement has been the addition of a lesser 'big' solo reed. The Tuba is just too loud to be comfortable, and for practice one sometimes needs something that can 'stride out over the top' so I have installed a rescued Jardine Swell Cornopean on a soundboard just behind my dummy case and given it the ideal pressure (around 4" wgp). Considering what it actually is, it sounds remarkably good and the sound always gives visitors a pleasant surprise. Pedal 32 (stopped) 16 16 8 8 4 4 two units, Bourdon and Salicional. A 16' Trumpet is prepared for. No manual extension or borrowing of any kind. Designed for my rehearsal use, the three-manual version (with the specification above) works very well. The tonal design may be a little unorthodox, but I can play almost anything on it and the pistons work too, this is important to me. When I was organist of an all-mechanical organ in the years 1995-2003, I used to have to top-up my practice on other instruments in order to prepare for big recitals or recordings. Although patently still 'work in progress' there have been quite a few little concerts on it already, three for friend's birthdays, two for visiting UK organists' associations, one for The UK Organ Club while they were on tour in the area and fairly surprisingly one for a party from the European Chapter of the American Guild of Organists then in the UK, visiting Yorkshire organs. I maintain a visitors' book and I greatly prize the kind comments many have written in it. barn again below where the Swellbox starts, this area is planned to contain the Main Great, the Solo, the Echo and some extra Pedal ranks. The Unenclosed Choir will go on top of the Swell box (so as to sound fresh and immediate) and will be reached by a ladder for tuning. A photo of the dummy case under construction. It remains unfinished, eventually all screw holes will be filled and the woodwork painted, quite possibly in a dark wine red. The dummy pipes (with flats filled) will be sprayed gold. I am thinking of adding two small stars to rotate when the Cymbelstern is drawn. It is intended to look like a Chair case, or Ruckpositive, and the panelling will continue to either side, reminiscent of a gallery front. The design is a simplified version of my logo, the Harris and Byfield case from St Mary's Shrewsbury where I was organist 1980-84. The recently-added new solo reed can be seen behind it, some work is still to be done to it - some resonators need remitreing! Inside the dummy case (not yet installed when this photo was taken) is now a small chest for the Mounted Cornet V.
The large green pipes partially visible at the back are the smallest pipes belonging to the 32' Sub Bourdon. Tibia 2 ) ALL ON 6" w.g.